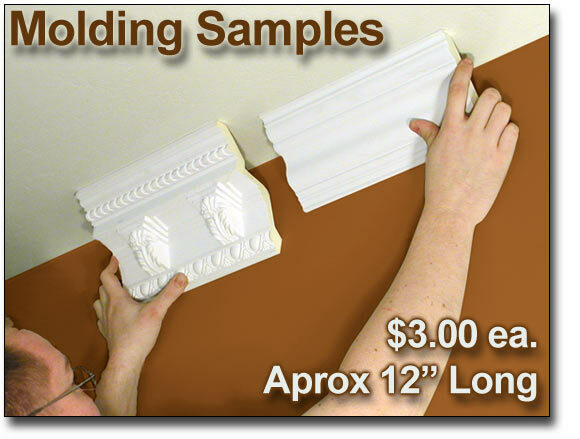 At only $2.99 per piece including fast, free shipping, these 10" molding samples offer the most affordable way to try before you buy. This page is only for ordering 10" pieces of your favorite moldings (crown, casings, baseboards, etc). Limited to 1 sample of the same product number per address (you can't order 2 or more samples of the same crown molding). Moulding corners, ceiling relief corners, and other pieces that are individual units must be ordered as a full piece separately. DSC-4015B or DSC-4015C (order DSC-4015 for profile). Select moldings from the literally 100's of styles we have in our in stock collection. Our fast, friendly, and knowledgeable staff will take care of the rest. If you have questions, please give us a call at 800-419-1130.